"What is better than a great New England chowder on a cold rainy day or at a family summer BBQ? There are many chowders out there that are either too time-consuming or too expensive for the average family to make. This version is one I have developed for my family and friends that is easy to make, does not break the bank, and also has the best interests of your waistline at heart. In New England you can buy chopped chowder clams at many of our local markets. If you do not have them readily available where you live, you can use canned clams. 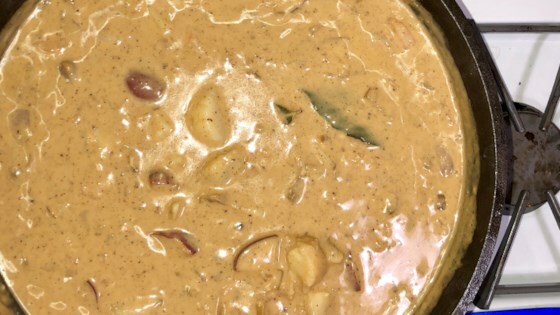 Serve with oyster crackers or some great garlic bread." There must be a typo on the black pepper - should be 1 Teaspoon not 1 Tablespoon - just wasted 4 pounds of great - seafood. This would be a good chowder if reduced pepper. A Little more work than I planned and pretty costly if you add all of the seafood which I did. Was perfect for Super Bowl with the Patriots playing. Highly recommend. I cut all the spices in half, and added only a half teaspoon of pepper. It was delicious ! No changes, it was good enough for company!